Every neighborhood has its own unique landscape, and the Belle Isle Moonshine team wants to help you navigate each of them. In our new Field Guide series, we're diving a little deeper into some of our favorite neighborhoods, showcasing a few of the businesses that help to make them unique with the help of some local influencers. 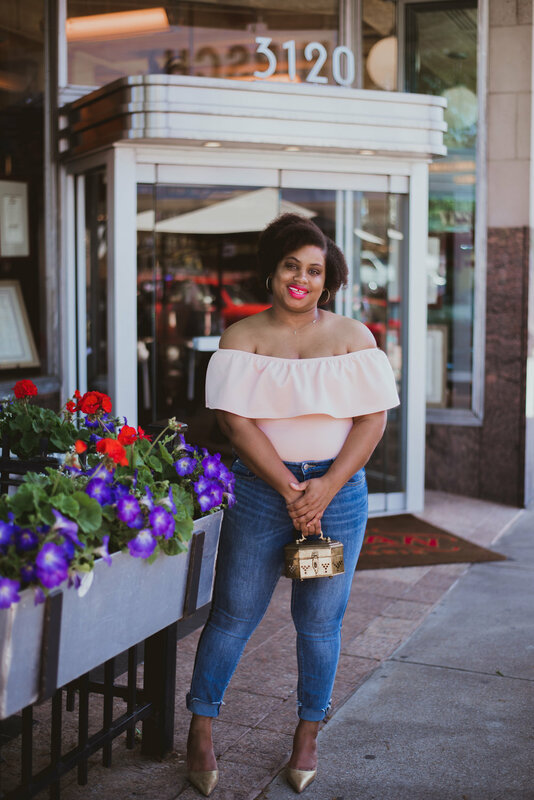 Our host in Richmond will be Shanna Battle, thrifting-maven and Content Creator-in-Chief of the style blog me and Minnie. With Shanna's help, we'll explore a few of Richmond's most notable 'hoods and the stores, bars, and restaurants that make them tick. First up: Carytown! Richmond has so many little pockets that will make you feel as if you’ve been transported to someplace else, and Carytown is one of those places. It’s as if a small, quaint little town popped up in the middle of the city. No matter how many times you visit, you always manage to get lost in the charm it has to offer. It’s one of those really dope Instagram pictures that pops up when you’re searching hashtags for places to explore in a new town come to life. The streets are lined with cute little shops, small cafes to pop into for a slow cup of coffee and a croissant, local musicians playing live music on the street, and tasty places to eat or have a cocktail. This is the place you visit when you’re looking for a bit of a slower pace and want to get away from the hustle of your week. Carytown is the place where you re-discover old loves and stumble upon new ones. One of my oldest loves is Ashby. She and I met years ago, and I can never leave Carytown without stopping by to say "hi." I love getting lost searching the racks, looking for someone’s trash to make my treasure. In a matter of minutes, I find a dress and some sunglasses that will be coming home with me and a pair of shoes that I plan on coming back for later. I go to purchase my items, and not wanting to feel like I’ve missed any hidden gems, I still walk the store from end to end before leaving; stopping to smell the candles and soaps made by local artisans, admiring hand crafted jewelry, and slowly doing a final once over the racks. As I leave my old love, I go in search of a new one. After walking half a block, I stumble upon Can Can Brasserie, a little touch of Paris in the middle of Carytown. When you walk through the glass doors, your eyes jump from the little mahogany booths to the Parisian tables next to an open window (a perfect spot for people-watching) to stained glass pillars, and then to the bar that seems as if it were carefully decorated with spirit bottles from all over the world. I take a seat at the bar, admiring the wall of spirits, and after a few moments Caleb asks me what I would like to drink. I asked him to recommend something, and he quickly whipped up a Suspended License or as he called it “The Ticket”! Caleb and I spark up a great conversation about this and that, and he gave me the recipe to the drink he made; which reminds me, I must get a bottle of Belle Isle Honey Habanero before my first party of the summer! The conversation was so great that before I knew it thirty minutes had passed. I realized I had to make my way back to reality, but I promised I would be back soon! When out-of-towners ask me where they should visit, Carytown is always last on my list. You may be wondering why, especially after I’ve spoken nothing but amazing things about it. I want this to be the final impression on a visitor to ensure they keep coming back for more. Post by Shanna Battle, founder of me and Minnie. Follow her on Instagram at @meeandminnie to get awesome thrifting, styling, and lifestyle tips! All photos by Sandy Swagger Jones. She also has an awesome Instagram feed, which you should follow @sandyswaggerjones. Check back soon for more installments of The Field Guide! Belle Isle Moonshine is a premium, handcrafted spirit proudly hailing from Richmond, Virginia. We take the name Belle Isle from a small, 540-acre island located smack dab in the middle of the James River where Civil War soldiers used surplus corn rations to make moonshine in copper kettles. Belle Isle Moonshine is distilled from 100% organic corn, grown by three family farms and responsibly sourced. Once triple-distilled, we charcoal filter Belle Isle four times over. Then, we cut it with purified water right from the James River. Our infusions are made with 100% real ingredients, never artificial flavors or color. We use real grapefruits sourced from Texas and California, local honey from the Shenandoah Valley, organic habaneros grown an hour away, and freshly roasted coffee beans from the most socially conscious roastery in Richmond, Blanchard's Coffee Roasting Co.
From there, each bottle of Belle Isle Moonshine is filled, corked, labeled, and packed by hand by our Production team, who check each bottle and batch for quality assurance. Since Belle Isle is made in small batches, you can find the batch number handwritten in the bottom right corner of each bottle. Distilled from good times and 100% organic corn. Wanna hear more of our story?